Climb aboard Renault Sport F1 and become one of the most valuable sponsors of the team. In line with its automotive history, Renault returned to F1 as a team for the 2016 season because motorsport is part of Renault's DNA for over 115 years; and this aspect is the opportunity to demonstrate his passion for cars and always innovative. Today, Renault therefore a new challenge, that of writing a new page in its history in Formula 1. This return must be all the more striking that the world of Formula 1 may seem exclusive and inaccessible. This year, the team of Renault Sport F1 is so down barriers and gives everyone the opportunity to enter the competition and be part of the team. How? By giving each Grand Prix, the chance to get on board with the drivers. 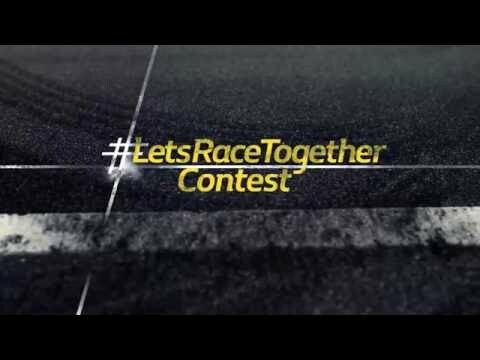 The process is simple: since April 18 and for every Grand Prix, simply tweet a message of support to the Renault Sport F1 team with the hashtag #LetsRaceTogetherContest to take part in the game. Two winners are selected for each race and their name is printed on Renault's F1 racing cars. And, since each support is invaluable, each tweet is rewarded with a personalized video giving the taste and spirit of the race.